My friends visited a couple weeks ago to meet baby Zain, and I was excited to start cooking again. On this day, I wanted to do a grocery run and make my cauliflower tacos. However, Zain had other plans (in the form of bowel movements and general activity level), and before I knew it it was an hour away from dinner time and I had 0% of the ingredients needed to make the tacos. So, I rummaged through the pantry and fridge (yeah right...both were nicely organized because my mom had just visited) and discovered a box of pasta, a package of paneer, frozen peas, and a bottle of pre-roasted bell peppers. 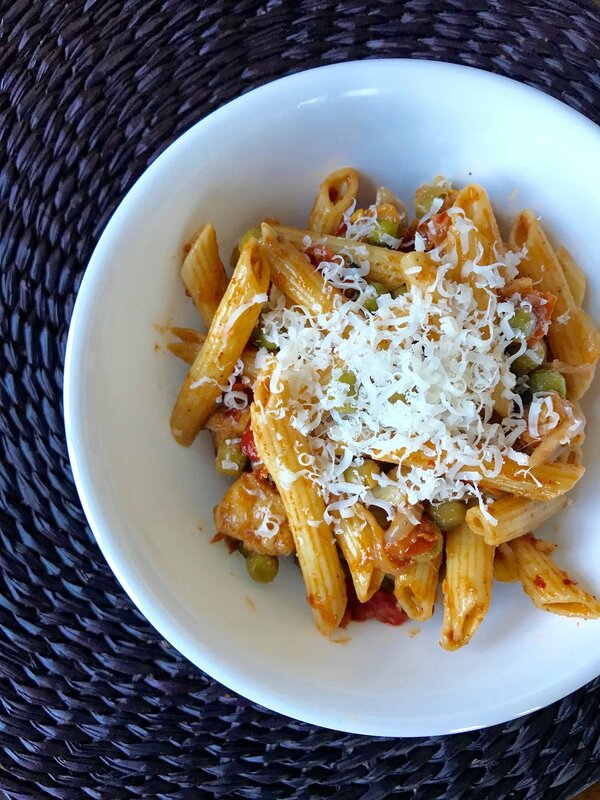 Given that mutter paneer is my all-time favorite thing to eat, I figured that combining paneer and peas with pasta and some spices and other pantry staples couldn't be that bad. I was right...this pasta was better than 90% of my straight arrow Italian pastas, and I can't wait to make it again. Heat oil in a heavy pot and saute onions for 4-5 minutes on medium heat. Add garlic, garam masala, and coriander powder, When garlic and spices are fragrant, add roasted red peppers and tomatoes, then bring to a simmer. Add the paneer and peas and cook for 5 minutes. Season with salt and pepper. Add pasta to the pot and fold in the sauce. Top with truffle oil and shredded cheese. As with all pastas, this tastes great on day 1 but even better on days 2 and 3, if it lasts that long.